Members of the Okinawa tourism campaign, including the three Miss Okinawa beauty queens, visited the Ryukyu Shimpo Office in Naha on July 28. A variety of events will take place in Okinawa throughout “Tourism Month” in August, including “Tourism Day” on August 1. On July 28, the three Miss Okinawa beauty queens visited the Ryukyu Shimpo Office in Naha to promote the tourism events . 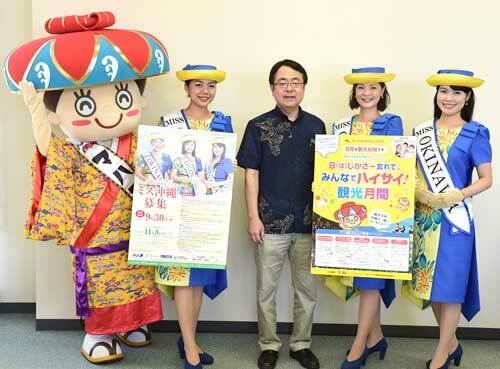 The Ten Thousand Eisa Dance Parade will be held in Naha Kokusai Street on August 2 and Hagoromo Festival is scheduled to be held at Seaside Park in Ginowan.